A large population of microorganisms live on our skin. Known as the skin microbiome, many of these organisms serve a vital protective function preventing psoriasis, acne and other diseases. 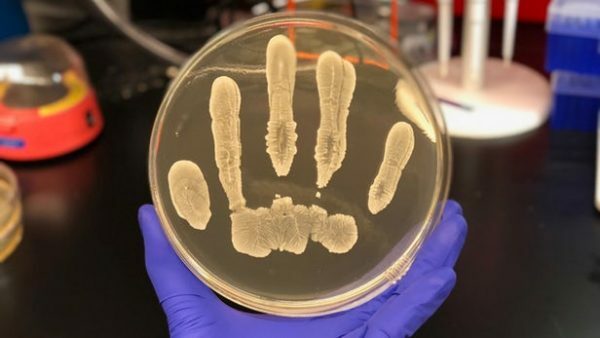 A team at the University of California San Diego School of Medicine has now uncovered a strain of bacteria found on human skin that can protect against cancer. “We have identified a strain of Staphylococcus epidermidis, common on healthy human skin, that exerts a selective ability to inhibit the growth of some cancers,” says Richard Gallo, one of the authors on the study. The research found that this particular strain of bacteria can generate a molecule known as 6-N-hydroxyaminopurine (6-HAP). This compound was subsequently found to have the ability to halt the spread of cancer cells, in particular UV-induced skin tumors. “This unique strain of skin bacteria produces a chemical that kills several types of cancer cells but does not appear to be toxic to normal cells,” says Gallo. The team studied mice with the bacteria strain applied onto their skin and found that when exposed to UV rays they developed significantly less skin tumors than mice applied with a bacteria strain that did not express 6-HAP. Even more interestingly the study found that intravenous injections of 6-HAP into mice transplanted with melanoma cells resulted in the tumors reducing in size by over 50 percent. The next phase of the research is to focus on whether 6-HAP can be used in humans for the prevention of cancer, but right now this study offers a compelling insight into yet another important symbiotic relationship between microbes and our own biology.